The energy of large scale primal motifs and bold colours are a dynamic combination. 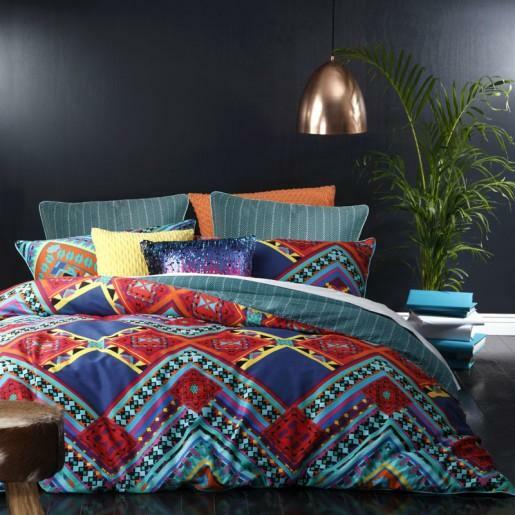 Luxuriously soft to touch, Jimbaran Spice Quilt Cover Set of Ltd. By Logan & Mason is inspired by the ‘tribalesque’ spirit of the South Pacific. Front: 100% cotton sateen print, the edges framed with cord piping in soft jade green. Reverse: 100% cotton sateen printed with an all-over small geometric pattern.